Christina Collins earned her Bachelor’s degree in Elementary Education and went on to receive a Master’s degree in Special Education from C.W. Post. Beginning her career in the Islip Public Schools, she taught Kindergarten and Resource Room for grades one through eight. She broadened her teaching skills by specializing in early intervention and working with young children. 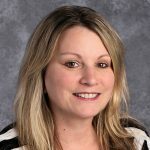 Mrs. Collins believes that she can help students meet their fullest potential by providing an environment that is challenging, supports risk-taking and invites a sharing of ideas. Mrs. Collins is thrilled to be part of the learning lab team and the Divine Wisdom family.